Germany was fairly late in entering the world of colonization, having only been declared as the German Empire in 1871. That said, the country still managed to acquire its share of land, leading to the issuance of German colonial stamps. These preceded other German occupation stamps from the conquests undertaken in World War I and World War II. The stamps of the German colonies are as varied as the colonies themselves; they include issues of East Africa, New Guinea, Cameroun, and Samoa, to name just a few. Togoland was another area the Germans maintained until World War I. Looking at a few of the notable German colonies stamps for sale, those of Deutsch Ostafrika, or German East Africa, are sought after. This area was established by Carl Peters, pursuant to a treaty between the native tribes. From 1885 until 1891, “forerunner” stamps from Germany were used, but definitive stamps for Ostafrika were issued in 1893. There were five issued, in various colors and denominations. Turning to the South Pacific, German Samoa was another notable area with its own stamps. 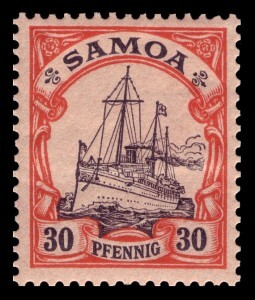 Initially, an overprint of “Samoa” was used on regular German postage stamps, but later stamps in denominations from 3 pfennig to 5 Marks were issued in 1900. All of these stamps were replaced later when German’s colonies were revoked following its defeat in World War I. If you wish to learn more about other German colonial stamps, contact Treasure Coast Stamps. We can help you find the stamps you need for your ideal collection.